Just 45 days ago if you were to ask my mom, if she wanted a dog, her response would have been (and I quote) “WHAT ARE YOU NUTS?! I don’t even want a houseplant!” But that was 45 days ago. Don’t get me wrong. My mother Ana is the kindest and most nurturing person. She has “orphan family” all over Aspen and enjoys the love and company of many. With such a rich life she felt that there was little time for the responsibility of a dog. But that was 45 days ago. 45 days ago I went to the Aspen Animal Shelter and Boarding Kennel for a visit. As a dog trainer in Aspen I like to stay connected with the professional staff there and see if there are any animals that need my attention. I got an eyeful when I met a dog named King. At 100 pounds of Rottweiler power he had an unmistakable presence, majesty. In his eyes was a vulnerability, like he was seeking something but was too proud to let on. He was tender but aloof, affectionate but independent. There I stood, teetering on the ledge that every dog trainer swears never to peer over, the irreversible jump off point where you consider taking home the dog at the shelter who gives you “the look”. One step over the line and its a nosedive into the lifelong relationship with a Rottweiler of unknown origin. My neighbors had varied responses, from the “you gotta be kidding me gape” to the “there goes the neighborhood glare”. That only strengthened my resolve to love, care for and train this dog within an inch of my life. Even my husband Chris, a man of limited emotional connections with dogs, had an instant bond to King, who we began to call Sam. 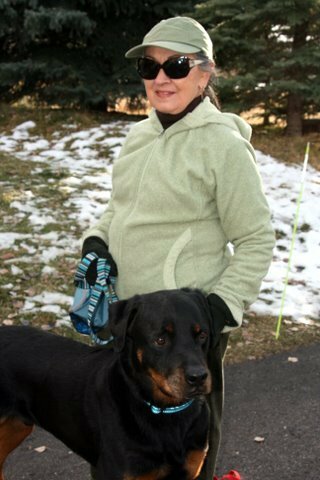 Yup, we had ourselves a Rottweiler to add to our neat little family of myself, my husband Chris, our 3 year old son Aidan and our Bernese Mountain Dog Zephyr of the same age. Fourteen legs running around a 1500 square foot home. Brilliant..
Then my Dad Vince stopped by the house. After taking my vitals he asked if I was clinically insane. He’s not much for dogs. Within 15 minutes I saw the film form over his eyes. Incredibly, he was headed for the ledge. He waited about 10 minutes before informing me that this dog was a special dog, one that he wanted for himself and my Mom, the lady who didn’t even want an African Violet. I have wanted my folks to have a dog for years because they live where it’s just bordering on that Little Red Riding Hood deep- woods feeling. My duty as a daughter first, and a dog trainer second sealed the deal in blood. I would train him for them, not us…gulp. I just had to get my Mom to agree to having Sam as a permanent house-guest. One dinner together and a gentle nose nudge was all it took. So, October 21 is Sam’s new birthday, the day he moved in with my parents. He is so loved. I am so grateful. My husband? Well he will have to wait a little longer to meet another once-in-a-lifetime dog like Sam. It may take longer than 45 days. Sam died tragically of untreated heart-worm only one year after moving in with my parents. He tested false negative for heart-worm both times we had him tested. He is missed.